See Demographics section for population from R.M. of Wood Buffalo's 2010 municipal census. Fort McMurray is a small city in Northern Alberta. 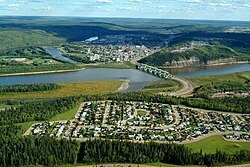 The city is also known as the Wood Buffalo Region. Fort McMurray has been popular because of the oil sands production which attracts thousands of people to move to Fort McMurray and work. Over the years, the construction around the city has been moving fast with new buildings, bridges, and wellness centres. A major fire broke out in May 2016. This page was last changed on 16 July 2016, at 21:24.